Clumps of molten lava (spatter) hurled above the rim of a spatter cone have already started to cool and develop a thin black skin on their surface. Width of the image is about 3 m. Credit: J. D. Griggs / U.S. Geological Survey. Close view of cooled, solidified spatter fragments hurled from an active littoral cone on the south shoreline of Kilauea Volcano. 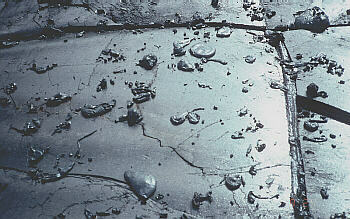 The impact of the molten spatter hitting the ground flattened the fragments into roughly circular disks. Credit: T. N. Mattox / U.S. Geological Survey. 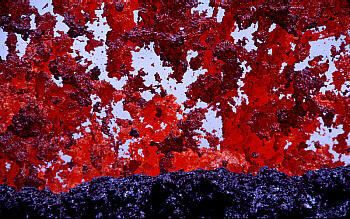 Spatter is formed from very fluid fragments of molten lava ejected from a vent that flatten and congeal on the ground. Typically, spatter will build walls of solidified lava around a single vent to form a circular-shaped spatter cone or along both sides of a fissure to build a spatter rampart.